The Uzbek border took hours, literarally, around 4 hours. The computer was down, the border is very busy and there is one person manning the immigration computer and one person manning the customs computer. By the time the computers came online again the queue was enormous. There were queues for customs, one for men and one for women. Since there were many more women than men I decided I was an honourary man. Often in Muslim countries foreign women are treated this way. Even so it was hot and humid in the small crowded room. Once through Immigration it was another long wait to enter the customs hall. At least the queue for inspection was short. Unfortunately the forms were in Russian cyrillic. Fortunately there were two Polish bikers with us who could speak Russian. They missed the bit about completing the forms in duplicate so there was another delay. Then the customs computer person went away. Eventually another person took over, starting from the top of the pile, the last person in the queue! We all had to wait around while these were processed first. At least more forms were not added to the top! Next came our inspection. The bikers had to take everytning out of their side bags. They were not happy to put it mildly. We had to open every draw. And finally we could leave. We were tired and grumpy by the time we arrived in Tashkent. It is always a bit nerve wracking to enter a large town and get your bearings and we were glad to find a good hotel. Dinner at a nearby restaurant consisted of goulash with 4 carbohydrates, rice, potato, pasta and cracked wheat! A wonderful shower, a good nights sleep and eggs on toast for breakfast did wonders. Sunday was Eid, the end of Ramadan. Celebrations were not much in evidence and only Monday was taken off. This meant a 3 day wait before we could go to the Russian Embassy. There was a crowd outside the entrance. We discovered they were all seeking Russian citizenship. People wanting visa were rare. As it turned out we could have gone on Monday but it would not have helped. We could not get a transit visa and needed a Letter of Invitation to get a 30 day visa. We were sent to a nearby travel agent who sorted it all out for us, at a price. Pieter as a Dutch citizen also needed health insurance which cost 4 times as much as normal because of his age. Uzbekistan is turning out to be an expensive experience! As an Australian my visa takes 7 working days as opposed to 4 for Pieter. Our hotel is great but expensive so we looked around for something cheaper. The hotel at the train station fitted the bill at a third of the price, a larger room and everything as good except no breakfast or wifi. Organizing a room was another story. We thought we had reserved a room only to find out when we arrived next morning that it had been taken overnight and the guest was staying another day. This time we spoke to Irina who could speak English. She made a note for whoever was on reception next morning that we had reserved a room, even so we arrived at 7:30 next morning to make sure. Then the palavar with Immigration started. No passport! A copy would be accepted but we also needed a copy of the Uzbek visa. We tried asking them to phone the Russian Embassy but they did not have the number. I don't think they have telephone books in Uzbelistan, except a Tashkent Yellow Pages, because this was not the first time that finding a telephone number was an issue. Eventually it was agreed that we could have a room but we would have to get a copy of the visa. I went to reception to explain what was happening and get a room key. When I came out Pieter was nowhere to be seen nor was the car. Initially I was very angry but figuring he had gone to the travel agency I took a taxi to the hotel had my last lovely breakfast and packed. Pieter eventually came, having obtained a copy of the visa from the travel agent, taken it to the hotel and been given a key for a different room. He missed breakfast. Serves him right for going off! A week to wait before we can move on! 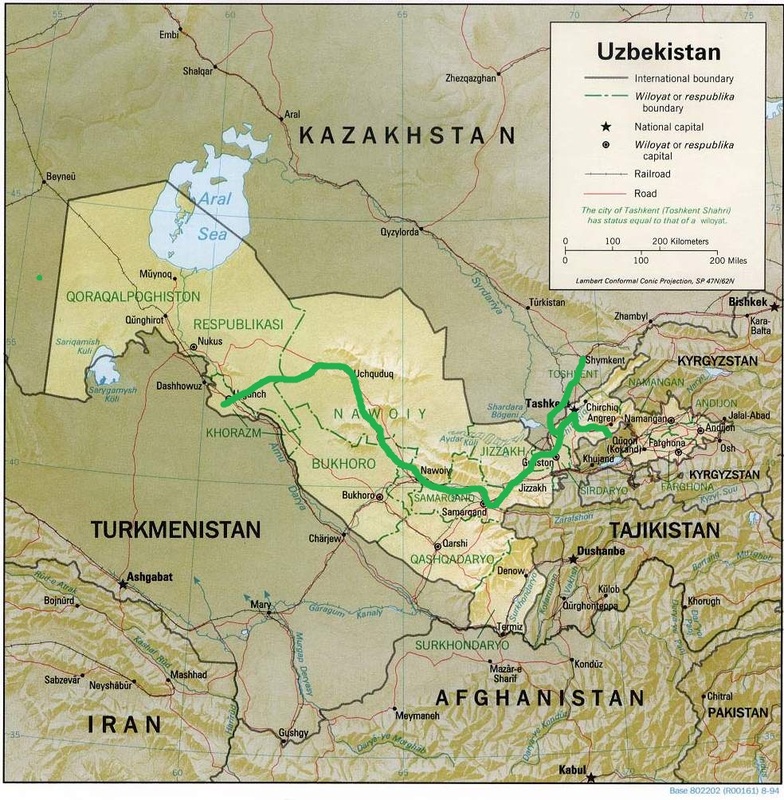 The Uzbeks are Aryan and only nominally Muslim. They weaar short skirts, shorts, sleeveless tops and casual dress. We did some of the touristy things as well. Chorsu Market is lively and large and interesting like all markets. There is also a Central Asian Plov Centre where we had lunch one day. The portions are huge. Basically Plov is fried rice with meat, vegetables and seasoning. Each region has its own special recipie and guards it. There are many rituals. dos and don'ts with Plov. LP mentioned that a young woman said she couldn't make Plov because she was under 21. We met other travellers who had come through Uzbekistan with a diesel engine. They had had difficulty obtaining diesel. Forewarned we tried to fill the tank. Many service stations advertised diesel for sale but none actually had any. Some truck drivers told us that trucks use gas as diesel is a perennial problem. Even the farmers have trouble obtaining enough for their tractors. In the end we decided to go by train to two of the three major tourist towns, Khiva and Samarkand. The car was left in a parking area near the hotel. In how many countries can you leave your car unattended in a public car park for two weeks? Very few! The over-night train to Urgench was very similar to the Chinese trains, just a lot older. There was the usual hot water constantly on tap and 3 tiers of bunks, although the top bunk was not used. In addition there were bunks along the corridor against the wall. The train was crowded. Khiva is magical. Ichon-Qala, the old city mainly from the 18th and 19th century, is well preserved. The mud brick walls and the buildings have obviously been maintained. The various medressas are a hotch-potch of souvenir stalls giving them some life and colour. One has been turned into a hotel. Wooden pillars are used everywhere. They have a small base with carving up to the top in some cases. The Juma Mosque has 218 wooden pillars, some from the 10th century. I didn't go looking for these. I assume they look very old. Tiles have been used lavishly. The Kalta Minor Minaret is unfinished. It was started in 1851 and was supposed to go high enough so you could see Bukhara, 99 kilometres away, from the top. In the Dishom-Qala, old outer city, I visited the Isfandiyar Palace from early 20th century. The decoration is a mixture of European and Asian styles, very ornate. One fascinating element is the thickness of the interior walls. Servants could pass in them to service the fires in each room. The actual fire could not be seen from the room itself. They were covered with inticate tile work. I would not like to live in a house with such busy walls and decorations. It would drive me up them! Our time was spent meandering around the city and visiting the various buildings. Eating was an imperative. The first night we were hungry and unfamiliar with the city. We walked through to the bazaar area and were invited to join 4 local men. One was drunk on vodka already. Another two bottles were consumed during the meal. The meal consisted of deep fried fish, bread and green tea. Not the best diet in the world but vegetables have to be brought in through the desert. Another day we came across a café in the bazaar where they sold delicious samsas, the Central Asian version of samosas. The weather was lovely and warm until Wednesday then it turned cold leaving us both with a touch of flu. The overnight train was as comfortable as before. We learnt to take provisions after our previous experience. People do come around selling biscuits, chocolates and some drinks, not really our kind of fair though. We had purchased a cheap mug, instant coffee, tea, fruit and several samsas. I thought the tea was in bags. It was loose leaves so I had to strain it through my teeth. Oh well! Pieter was not up to walking any distance so I went sightseeing alone. Everything is very much restored. Photos from the beginning of the 20th century show mostly ruins. The Russians restored them a few years later. Even so the restored buildings are impressive. The Registan contains 3 medressas all covered with majolica, azure mosaics and with vast well-proportioned spaces. These are the oldest preserved medressas. Ulugbek medressa is the oldest from1420. Sher Dor medressa was finished in 1636. Tilla-Kari medressa was finished in 1660. This incorporates the Gold Mosque. The walls and ceilings are covered in gold. The ceiling is fascinating. It is actually flat but the tapered design makes it look domed on inside. Aah the power of jealousy. Near the Registan complex is the Bibi-khanym Mosque. It was the jewel in Timur's crown to celebrate his Indian campaign. It was built while Timur was away on another campaign. The architect refused to finish the mosque unless Timur's wife (Bibi-khanym) gave him a kiss. The kiss left a mark and when Timur saw the mark he ordered women to wear a veil so as not to tempt other men. The architect was executed. So that is why Muslim women have to cover their faces. The Shah-i-Zinda cemetery contains many well preserved mausoleums. The main shrine is for Qusam ibn-Abbas, a cousin of Mohammed who brought Islam to this area in the 7th century. The shrine includes a small prayer hall. You cannot pray here but you can read from the Koran. In the 14th century Timur and later Ulugbek buried their family and favourites near the 'living king'. The mausoleums are certainly sumptuous. The journey to Tashkent was smooth and short. After a night's sleep we headed for Shymkent in Kazakhstan. The border is quite a distance south of Taskent even though Shymkent is about 50k to the north. It added a few hundred kilometres to the journey. The Uzbekistan border was just as bad going out as coming in.